In collaboration with the Computer Science Engineering Department in the College of Engineering and the School of Music at the University of Michigan, Girls Encoded is organizing the Ada Lovelace event to celebrate women in computing. Ada Lovelace is widely recognized as the first woman programmer who greatly influenced the field of computer science. Countess Lovelace, daughter of famed poet Lord Byron, was a gifted mathematician and is considered to have written instructions for the first computer program in the mid-1800s. 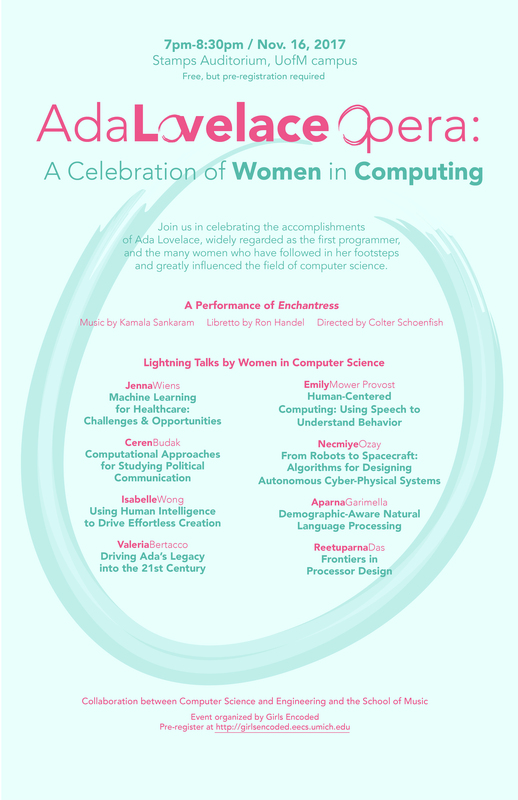 To celebrate Ada Lovelace’s life, a performance of the Opera “Enchantress” will be followed by lightning talks given by U-M women faculty in computing.